Looking for an excavation contractor in Jacksonville Florida for dirt work? Dirt work consists of all the behind the scenes work necessary to prepare a work site for building. Many processes go into preparing the land to build a solid foundation, and Duval Paving, LLC specializes in getting it done right. From clearing to excavating to installing drainage, Duval Paving, LLC has provided comprehensive dirt work services in Jacksonville for over 8 years. When you're ready to develop your land for residential or commercial use, call the experts at Duval Paving, LLC at (904) 201-2161.
and much more. Call (904) 201-2161 for details. When you call Duval Paving, LLC for Jacksonville excavation of land, you will quickly understand why were have become a local favorite. Call (904) 201-2161 for a consultation and quote for services. The first thing you'll notice is that your call will be answered by professional staff, ready to schedule a meeting on location. Our crew will arrive to your property on time and provide a written estimate to get your job done. 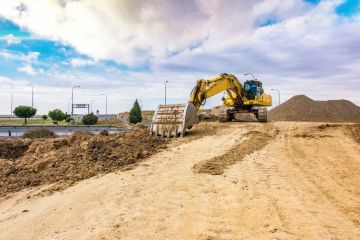 From clearing weeds to grading surfaces for road work, Duval Paving, LLC provides quality excavation services at fair pricing in a professional manner. Installing draining requires much more than digging a trench. Finding a quality drainage contractor in Jacksonville means that water will be rerouted away from your building and not be allowed to stand, saving your property investment. Proper land drainage prevents pooling and flooding on property and extends the lifetime of it's structures. Duval Paving, LLC specializes in designing highly effective residential and commercial land drainage systems. Our Jacksonville drainage crew will arrive to your property and inspect the topography and soil type on the land. After we've completed our assessment, you will be left with a written quote for getting job done. Call (904) 201-2161 today for a free written quote.